The Upper Chesapeake Bay is in great shape right now and producing some good sized largemouth and Smallmouth bass, The water is stained to muddy most of the time but bass seem to find enough clear water to spawn in good numbers. The best river right now, in our opinion, is The Northeast. While it is smaller than other rivers that flow into the Upper Chesapeake Bay, such as the Sassafras, The Elk, and The Bohemia, it has a variety of structure and grass that hold baitfish and huge numbers of quality bass. In most tournaments from late March until July, it takes 20 pounds or more to win! Many bass in the 5 and 6 lb range are weighed in each week in multiple events on the same days. The docks and grass flats have always been great areas to find quality bass, and during low and slack tides, a finesse angler, with skills in drop shotting and other light line methods, as well as the ability to read sonar, can take quality bass while waiting for the tide to turn. The main baits for all these rivers are jigs, frogs, buzzbaits,chatterbaits, spinnerbaits, crankbaits and soft plastics, depending on the tides and time of year. We have several videos here at The Bass College showing exact locations, techniques, and how to read sonar to catch more and bigger bass on these rivers. The owner and staff have been fishing and guiding on these rivers for more than 30 years and can help with any tactic or locations. These strategies will not only help you catch more and bigger bass by identifying new locations, but will also help you locate and catch more bass during a tournament, from within the known community areas by defining the "Sweet Spots", within these community holes. These strategies and techniques will work on any rivers on the Upper Chesapeake Bay, but are designed to enhance your success on the Sassafras River and Northeast in particular. The Upper Chesapeake Bay has been receiving a lot of notoriety over the last few years due to the improved catch rates and overall weight increases reported in the tournaments. While the "true" river rats have known of this bass fishing hotbed for some time now, the recent success is attracting clubs from all over Maryland, Pennsylvania, New Jersey, and even as far away as New York. Most of this pressure has converged on the Elk River, The Northeast, and the Tyding's Park area in Havre de Grace, Md., since these areas provide more than adequate launching and parking facilities that are necessary to hold the tournaments. Many of the smaller club tournaments also start from the Northeast and Elk River areas. With this influx of angling pressure, many of the traditional "hot spots" have become increasingly crowded during the weekends, and have forced anglers to make longer and longer runs in search of untapped bass waters. Many of these anglers have now discovered that the twenty to thirty minute drive through sometimes rough and unsafe water, to the Sassafras River, has been well worth the effort, but the longer run to Middle River areas has produced the winning bags recently in minor and major tournaments in the last few years. Upon arriving they realize that not only are these areas not as pressured, but the fishing rivals or surpasses any that they previously encountered on any of the other Upper Bay rivers. Over the past five years, we have spent an average of four days a week on the Northeast, Middle River, and Sassafras River, and over this course of time have learned many of the subtle intricacies of these scenic and fertile river areas. The following locations and patterns, have not only produced tournament winning limits, but have produced over one hundred bass in the five to six pound range, over the last five years, from this river. These are true "Trophy" bass for a Northeastern River system. The first thing to do is to decide where you will launch from to access the Sassafras, so as to take full advantage of your time. The Elk River, via Elk Neck State Park, is probably the most popular, due to it's more than adequate parking facilities, and close proximity to the Sassafras. This is only a ten to fifteen minute drive from the Sassafras, or launch from Anchor Marine in Northeast and make the run across. Tyding's Park and Marina, located In Havre De Grace, MD, is the farthest, and most difficult drive to access the Sassafras River, but this is where I would launch to reach Swan Creek, and then down to Middle River. We launch from this area only when we have located good numbers of bass on the Susquehanna Flats or in the nearby coves or docks of the Northeast and in Swan Creek. The drive from here can be dangerous in the early morning fog and heavy boat wakes in the Spring and Summer. At fifty plus mph, it takes about twenty five minutes to reach the first starting point on the Sassafras, or just 10 minutes to Swan Creek, which has been a hot area in the recent years. The best area to launch in the Sassafras is in Duffy Creek, located right behind the Granary Restaurant, on Sassafras Street, in the town of Galena. This is a private marina, with average parking facilities, and a good ramp. It is a pay per use facility, and charges a daily fee of $5.00. The second area to launch is the public boat ramp on Sassafras Street, right before the restaurant. This is a small boat only ramp, but it is adequate for launching most any bass boat at the proper tide. In low tide situations, this can be a tricky ramp, so great care should be taken during these times, as it is extremely shallow, and has ruined many a boat prop and hull. The next spot you can launch is a ramp located in Turner's Creek. This area has the most parking, and offers a middle of the river launch site. Although the Sassafras offers excellent fishing all times of the year except the winter, the early Spring is the best time to start. Spring on the Sassafras is similar to any other body of water, in the respect that the bass's life revolves entirely around the spawning process, and the locating of spawning areas. The Sassafras normally holds bass in almost every area of the river, but at this time of year, it suddenly shrinks to a few, and eventually, two major creeks. In the early pre-spawn, largemouth can found in the emerging grasses and the wood cover, in locations such as Hall's Creek, Freeman, McGill, Turner, DuPont, and Lloyd's. As the spawn gets even closer, they make their way to Turner's and Lloyd's almost exclusively. Turner's Creek offers a huge amount of diverse cover for bass. There is a narrow entrance to this creek where the main river channel runs right along a wood laden bank with a steep drop-off. Pre-spawn bass lay along this drop at depths from two to eighteen feet, all of which is loaded with laydowns and emerging vegetation. Directly next to the entrance is a small bay loaded with lily pads and several varieties of emerging grasses, on a slow tapering bank, that eventually levels off into the main river channel. This area at the entrance to Turner's Creek, is one of the two major staging areas for largemouth in the Sassafras. The Western shoreline of this creek is totally covered with what are emerging lily pad root systems, that are mixed in with several varieties of vegetation, including Milfoil and Hydrilla. Many bass choose these root systems to spawn. The Eastern shoreline offers a hard sand and rock bottom, along with vegetation, that mixes in with a number of large boat docks. The bass use the docks and standing and decaying pilings to hold on, and eventually make their beds on, to escape the current and predators which are prevalent in the river. When targeting pre-spawn bass at the entrance of the creek, spinnerbaits are our weapon of choice. Terminator spinner baits in the 3/8 and ½ ounce sizes, with tandem blades are top producers, as well as a ZMAN Chatterbait in a variety of colors depending on the water. War Eagle and Lucky Craft spinnerbaits take their fair share of bass in the spring as well. Color is not that important this time of year in the stained to muddy water, but we have had the best success with baits that imitate the shad, in white/chartreuse, and in "Golden Shiner" patterns. If the water is truly "muddy", then we will use a darker skirt many times. We burn these baits across the emerging grasses and around the lily pad root systems, causing aggressive strikes with an erratic retrieve. When we are looking for that one particular big bite, to upgrade our limit, the baits we use are "Senko's". These baits also produce all sizes of bass better when a cold front moves through, and causes the action to slow down. When a severe cold front blows through over a few days, it will cause the bass to drop down to deeper water in the ten foot range, and hold on the tops of trees. When this happens, we target them with mid range crankbaits, using a stop and go retrieve, with great success. Once the bass move to the backs of the creek to spawn, "Senko's", "Yamamoto" "IKA" tubes, "Zoom" flukes, lizards, and Terminator jigs, flipped into the docks, grass, and pads, produce a good limit in short order. On the weekends in the spring, this area can be crowded with many other anglers, and small to midsize crank baits, such as a "Mann's" Mid-Minus, and a "Strike King" series, can be a great tool in addition to the spinner baits,chatterbaits, and plastics. Don't hesitate to throw a buzz bait around the same cover, once the water temperature warms to fifty-five degrees or above. This can produce some real hawgs at this time of the year. We like to use a custom type clacker buzz bait by Strike King, but there's many brands that work well. We also have great success with the "Terminator" Ball-Buster. One year in April, with water temperatures only in the fifty's, these buzz baits produced a seventeen pound limit by 10:00 am, in a team tournament, with the biggest bass weighing 5.6 pounds. The old standby, the black and blue Terminator jig, with pork or plastic for a trailer, placed in and around pilings, ladders on docks, and floating piers, will always produce good sized bass. Most anglers use the jig when fishing docks, but switch to other baits many times in the laydowns. This can be a mistake, as many times in the spring, we caught several bass in the five and six pound class, flipping the wood in Turner's Creek with this jig. Turner's Creek is a hot spot at all times of the year, but it is especially productive in the spring. An experienced angler can expect ten to fifteen bass on a good day from this creek alone. Although at times, other creeks can produce more bass, this creek gives up the better quality bass on a consistent basis. Our largest bass from this creek was 6.4 pounds, but we have heard of seven pound bass being caught on occasion. This is the most productive spring spot on the Sassafras River. While largemouth bass spawn in several creeks along the river, the majority of them choose Lloyd's Creek. While there is a very strong current at the entrance to Lloyd's Creek, the rest of it has very little movement. Besides the ideal cover, bottom composition, and sun exposure, Lloyd's offers something else that makes it an ideal spawning ground for tidal bass. It has a clear and defined channel leading into the creek, and into all points along the shoreline. This provides a virtual "Freeway" for the bass to follow. This makes the job of targeting these bass under changing water conditions and seasons fairly simple. I believe that this is the reason that not only huge numbers of bass in the Sassafras come here, but I believe they come from other nearby rivers as well, and possibly even from farther away. In the early spring, bass will begin to stack up at the entrance to Lloyd's Creek in amazing numbers. The water is fast here, and goes from sixteen feet in the main channel, to as shallow as one foot on the shore. This steep drop-off runs from about three hundred yards from the entrance in the fast moving water, to about fifty yards into the creek, and stops at a large dock. The whole shore on this side is loaded with old trees, brush, and rocks. On the opposite side a huge peninsula comes across forming a perfect sand point twenty yards from the steep shore. That twenty yard space Is the entrance to Lloyd's Creek. This is why the current rips through this area at an unbelievable pace. Even a trolling motor of 24 volts, can barely hold position on its highest setting in this area. The bass congregate all around this sand point and the adjoining areas. The best baits for this area are Rat-L-Traps in blue/chrome, in 3/8 and ½ ounce sizes, Terminator and Lucky Craft baits in ½ ounce, with tandem, and/or willow leaf blades, and small crankbaits. About ten yards from the tip of the point, the current swirls to form a large eddy. Many times fifteen to twenty bass in the one and one half to three pound range can be caught on successive casts to this eddy. The other tactic is to cast your bait right up on the sand point, and then pull it into the fast moving water, and the bass just slam the bait as it enters, many times on every other cast for an hour or more. On the opposite shore, the bass bunch up on the wood, as it is the only thing blocking the current. At slack tides these bass will slam the same reaction baits as on the point, however, when the current is swift here, the best thing to do is flip heavier jigs and plastics into the wood. The reason we like the "Terminator" jigs for this and other types of cover, is the eye is recessed into the head, preventing the jig from becoming snagged at least 75 % less than other jigs. With the nasty cover in this area it is a necessity. When this area starts to become pressured by other anglers, we have switched to an "IKA" tube, with a 3/8 ounce Tungsten weight, with great success. We flip these baits to the up current side of cover and let the tide wash the bait past the object. Most strikes come as soon as the bait washes past where the bass are holding. Watching your line is a must here, as the current makes most strikes difficult, if not impossible to detect. The only plus side to this is that because of the amount of energy these bass have to expend to fight the current, they almost never miss the bait once they commit. Heavy line with high abrasion qualities is a must here. We use twenty-five to thirty pound test line here, and still break off the occasional fish. When tournament fishing in this area, we retie after every fish. The next spot is the dock where the river channel stops and makes a sharp right turn towards the back of the creek. The best areas of the dock are the first three pilings from the rocks out. Jigs, tubes, and weighted plastics take numerous bass in the two to five pound range from here. These three spots form the ultimate staging area. More bass will move into this spot almost as fast as you can catch them at times. These bass are also extremely aggressive. The best tip for this area is to get there early in the year. You will not only avoid the crowds, but encounter some of the larger pre-spawn females. You don't catch as many bass very early in the year, but you can expect ten to fifteen bass in the three to five pound range at this time. When the Spring is in full swing, the bass will follow the creek channel to the barges, pilings, and laydowns in the back of the creek. This is when large numbers of one to three pound males make their way to the staging areas. There is a two to three week period when these bass will attack almost anything that hits the water. This is when it is wise to stop at the entrance for a quick ten pound limit, and then move back to the sunken barge for the larger females. Weightless Senko's and IKA tubes with a pegged weight, produce heavyweight females when pitched to the grassy edges of the barge. A quickly retrieved spinnerbait or chatterbait is needed at times to pick the males off the edges of the barge before going after the larger females with plastics. Laydowns will also produce just as well as sections of the sand bar now. Slow down and cover the whole area to be rewarded with a huge sack of bass. When the spawn has run its course, just follow the same creek channel back out to the same areas where the fish staged in pre-spawn. Similar to early in the year, the larger fish will be the first back out also. This is plastics time! The fish are fairly sluggish now, so a little more finesse is required. They want an easy meal, and soft plastics like these fit the bill! As the smaller bass make their way out to the mouth of Lloyd's, you will see bass hitting the spinnerbaits and crankbaits again. While the following migration routes to success can be simple, there are a few tricks that can help you upgrade your limit. In the middle of the spawn, anglers will crowd around the hot spots we have mentioned. Some of these anglers will be targeting the shallow fish spawning, and others will be pounding the pre or post spawn bass at the current washed mouth of Lloyd's Creek. At this time, we use our depth finder to locate and follow the creek channel from the staging area back towards the spawning area, looking for bends, humps, and even weedlines that run on the edge of the channel. Sometimes we mark fish on the locator, but the structure is all we are really looking for. We drop the trolling motor and begin dragging a Carolina rig with a French Fry worm or another type of plastic bait, and even crank the edge of this structure with a small crankbait. It doesn't always produce, but at times you can really load up on these migrating bass, and have the area relatively to yourself. The second trick we use at the very end of the spawn here is that we turn on the electronics and find the first major piece of structure large enough to hold bass and baitfish that have left the creek. The key word is close. We stay within one half mile to a mile of the major spawning area when looking for these spots. The key spots will have grass and offer deep water escape routes nearby. We use buzzbaits, spinnerbaits, and plastics on these fish. These fish are always quality fish. You may only get five bites a day doing this, but more times than we can count, this technique has produced eighteen to twenty pound limits from five fish. The Northeast River offers one of the best flipping bites on the bay, as well as being a twenty minute ride from the Sassafras. Depending on the grass situation, Cara Cove can produce well. The Northeast docks and sunken piers and old concrete and pilings produce good bags as well. This takes some time to find and being able to read sonar aids in finding these offshore and hidden spots. The Bohemia offers average fishing for bass, but is a quick shot to both the Elk and the Sassafras, and is a good middle of the road launch point. For the angler that has a smaller boat, who can't stand the longer, more difficult ride to the Sassafras from the Havre De Grace ramp, this is a good place to start. The docks located in the Northeast and Elk are prime targets for the bass, as these rivers are devoid of most of the structure that the Sassafras offers. The bass hit plastics and black and blue Terminator jigs well here, on both the outgoing and incoming tides. Placement is critical here. The jigs must not only be put into the smallest of holes and openings, but must be presented multiple times, with a quiet entry, before a strike occurs. Practice your flipping and pitching techniques before attempting these waters. At low tides, or slack tides, a drop shot is the key. You MUST spend time searching for these areas with sonar and understand what you see. we use a Garmin unit, and a Hummingbird 360 to find these areas. There are multiple videos on The Bass College site and Youtube channel that show how to do this. The docks by the jetty in the Northeast are the best for these techniques, and the Furnace Bay cove offers the best spinnerbait and buzzbait action early in the year, before the grass becomes matted all the way to the surface. Spring fishing on these rivers, and the Sassafras in particular, offers some unbelievable action at times. These rivers are suited to every style of fishing. If you're a flipper, it is there. 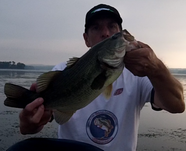 Spinnerbaits and crankbaits will smoke them! There's grass, docks, wood, current, eddies, ledges, barges, and points. And all of them hold bass! We have experienced eighty fish days in the Sassafras in the spring, and thirty to forty fish days on some of the other rivers. The Sassafras is a beautiful river with tremendous habitat, and a good population of bass. While it is a great place all year, in the spring, it can be a real "Hotspot". So hitch up the trailers, rig the rods, and get rid of the winter cabin fever blues with some super Chesapeake Bay largemouth bass fishing! Stop in our new forums on Facebook and get reports, videos, tips, and find out the current conditions on the bay. For detailed video instruction on the Upper Bay just click on the video link in the left sidebar and use the drop down box for Upper Bay Rivers. There is also a video site map showing where everything is.